Bon weekend dear readers from an unseasonably sunny Provence. It’s hard to believe that we’re already half-way through October and I’ve yet to put my summer clothes away… we’re having amazing weather for this time of year. 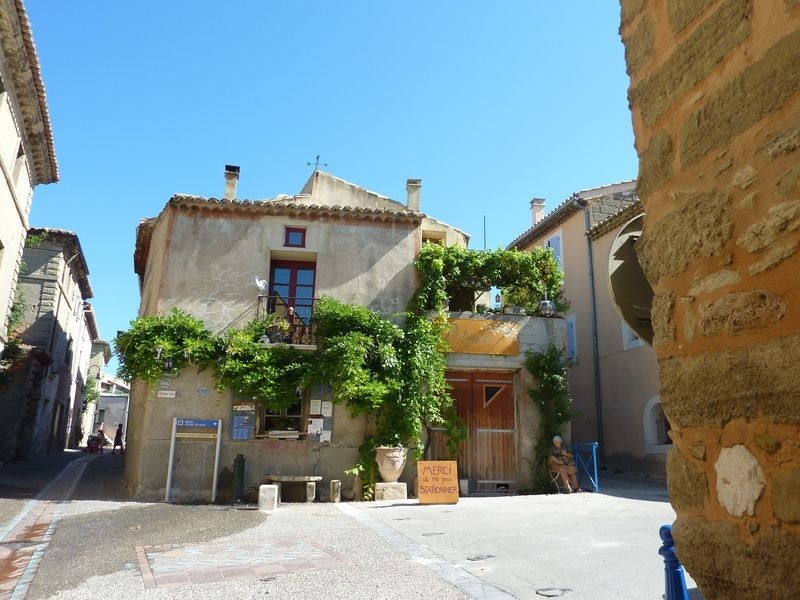 And another great thing about today is that we’re fortunate to have another guest post from Provence-expert extraordinaire, Sue Aitken of Boutique Provençale. Sue takes us along on her fabulous road trip to Le Gard for some sightseeing, market stops, and lovely Provençal-pottery finds. Although the department of the Gard is strictly speaking in the Languedoc Roussillon, it has a distinctly ‘provençal’ feel to it – thanks to it sharing a border with both Provence and within easy reach of the famous Camargue national park, famed for flamingoes, wild horses and bulls. It was a fairly long haul from my starting point of Sanary sur Mer – but I’d long wanted to visit Uzès (actually a Duchy in its own right) and its market. And as I also wanted to visit a potential new pottery supplier located nearby, I thought it would be well worth heading west. It’s practically motorway all the way from Sanary to Nîmes – the largest city in le Gard, and famous for its Roman amphitheatre, the best preserved Roman arena in France. Another interesting fact is that it was in Nîmes that the fabric denim was created – originally called Serge de Nîmes. However, as I wasn’t in the mood for negotiating city traffic, I headed for the Pont du Gard – the famous Roman aquaduct bridge that crosses the Gardon River, from which it takes its name. 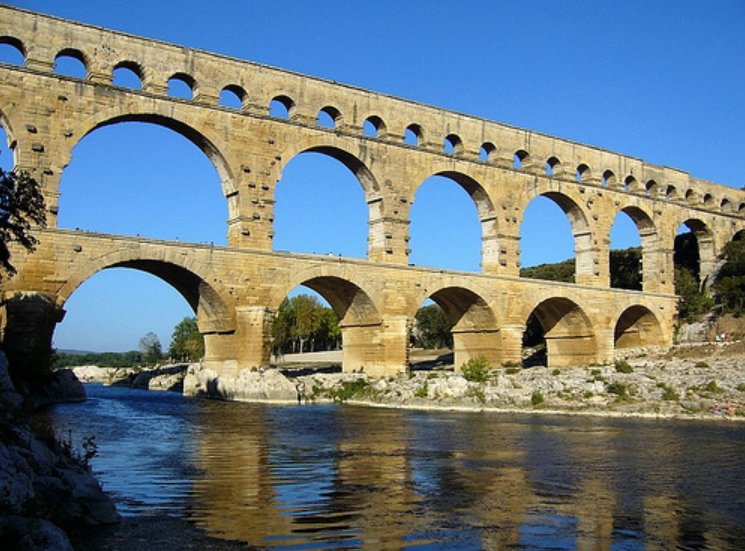 You can choose to view the Pont du Gard from the left or right bank of the river. But whichever you opt for, it’s a really spectacular and impressive sight. From the Pont du Gard I headed across country towards St Quentin La Poterie – a small village a stone’s throw from Uzès, but which is home to over 23 different artisan pottery workshops. The village itself is quite attractive, and with the Friday market in full swing I was quite tempted to stop and take a look around – but I was a woman on a mission and headed straight to visit Poterie Galtié to discuss our first pottery order with them for the website. The Galtié designs that I selected are very pretty and colourful and I’m really looking forward to receiving our new products at the end of October. As a pottery fanatic, I really should have taken the time to visit the Mediterranean Pottery Museum that’s in the village, but instead I decided to head out for Uzès. Uzès has a history dating from Roman times. The circular streets around the historical centre were once walls that protected the medieval castle in the 11th and 12th centuries. The ancient centre houses Le Duché, a medieval castle with four towers and the tall Fenestrelle tower at the cathedral, reminiscent of the Leaning Tower of Pisa. The centre of Uzès old town is full of medieval streets ideal for wandering and exploring. The Tourist Office has a printed tour of the historic town with a good map and describing the key places of interest. I decided to have lunch in one of the many restaurants in the Place aux Herbes. This attractive square with its central fountain, historic buildings of white stone and many arcades is the centre of the Uzès Saturday market and is a great spot for people watching. After lunch and a wander around the old winding streets of Uzès I headed to Montarens where I had booked to spend the night in a maison d’hôte called Monte Arena. Set in a lovely old stone village house, the rooms are spacious and beautifully and tastefully decorated. Martine is a wonderful hostess who takes a real interest in her guests and is full of good tips for what to see in the local area. Monte Arena is well worth considering if you’re planning on visiting this part of the Gard. Martine recommended a restaurant in the village called La Table 2 Julien and I decided to dine there rather than go back into Uzès. I had an excellent meal – dishes were sophisticated and beautifully presented – and service was friendly and helpful. Definitely recommended. Saturday morning dawned and, after a delicious petit déjeuner courtesy of Martine I headed back into Uzès to visit the famous market. It was relatively easy to park in one of the large car parks, although the traffic was extremely busy, even in September. I expect visiting the market in July and August must be quite a challenge. The market more or less takes over the whole of Uzès. The Place aux Herbes and all the surrounding streets are crammed with stalls selling mainly produce from the local area – everything from fruit and vegetables to saucisson, cheese and olive oil. 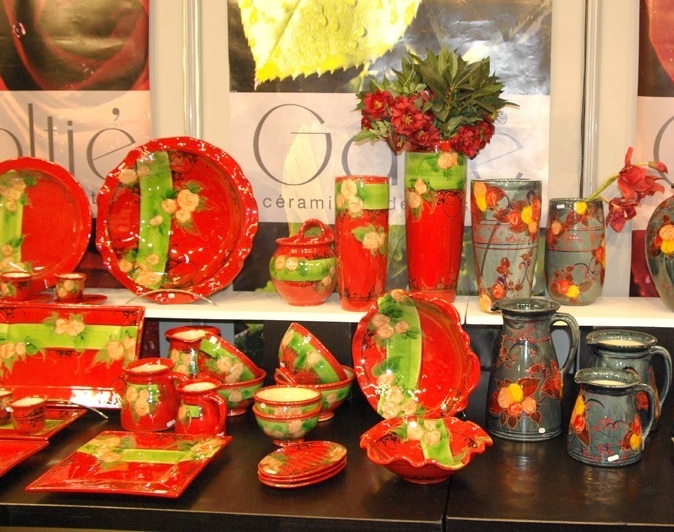 There are a few stands selling local pottery, olive wood kitchen accessories, soaps and textiles. And a whole section of the wide boulevard that surrounds the city has stalls selling everything from CDs to fashion. It’s a bustling and lively market, but in my opinion, not nearly as good as the Wednesday morning market in St Remy de Provence which has many more stalls with local artisan craftsmen and women selling their wares. So my advice is that although is Uzès is definitely worth a visit, you shouldn’t worry about scheduling your visit for market day – St Rémy or Aix would be a better bet. Other places worth visiting in this part of southern France (things I didn’t get to see, but plan to visit at some stage) would be the Gorges du Gardon, the Cirque de Navacelles and the villages of Montclus, Aiguèze and La Roque sur Cèze – all three on the list of France’s Most Beautiful Villages. Many thanks to Sue for this fantastic article on her roadtrip to Le Gard. Learn more about Le Gard Provençal on this tourism site for the region. Tuula and Sue: Serendipity! I was just talking to a friend here who will be spending two weeks in Uzes next June, and forwarded this post on to her. So, now you’ve got me too……just may have to visit next summer! thanks so much for this information..